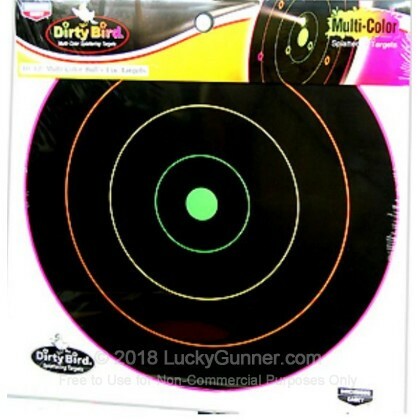 Dirty Bird targets made by industry leading Birchwood Casey are an excellent training tool to help you hone your accuracy. Birchwood's patented technology causes the bullet hole to explode in fluorescent color providing instant feedback to the shooter. Each concentric circle has its own color splatter, so you can tell by the color how close you are to the center saving a walk down range! These non-adhesive targets are made with heavy tagboard construction making them easy to affix to any surface of your choice and easily save for future reference. 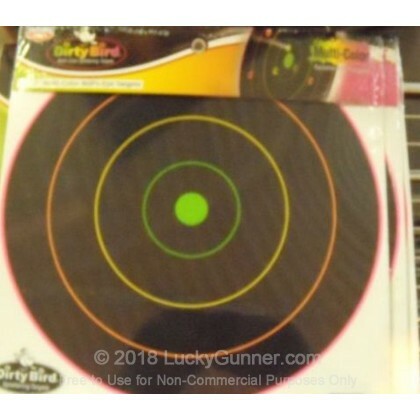 This kit has 10-12" Targets. I Use these to help family and friends to see what they are hitting. Regular targets hard to see unless we use a spotting scope. With these targets we have a much better visual. When ready, I'll put these on moving targets. Convinced the range owner to make a 7 yard shooting range in addition to his 25 yard shooting range. I drop off some of these targets in thanks for his support, they love them. Great targets. Easy to spot shots. Very good quality, thick plastic. Easy to see shots. Really nice high quality targets! Nice Targets, as you can see where your bullet hit, and then adjust if you are a little off ! I can SEE where I hit! Nice contrast on Bulleye's misses. I used a pistol and shot 50 rounds into each target without loss of where I hit. Thick photo copier type paper that is wind resistant.